We are so excited to welcome our newest couple Mallory and Griffin. I can’t wait for their Spring wedding at Richwood on the River. It is one of my most favorite locations. It has a kind of natural feel and so relaxing. I can’t wait for their wedding next year! Does the thought of sending out cards make you stressed? We are helping to make it easier for our couples and families. We have several designs to pick from and we can even put your return address on your envelopes. Just make a copy of your guest list from your event. I am loving the silver and gold foiling too! 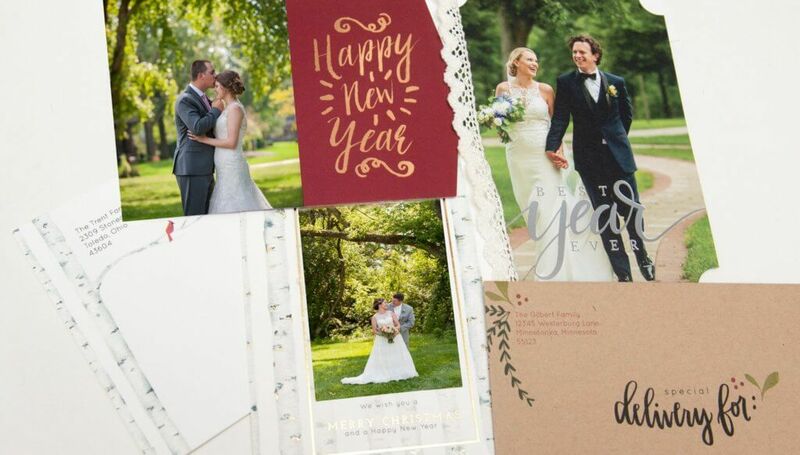 And a fun new trend – let’s make them new year cards or best year ever cards! That way you have more time to mail them with less pressure. We are so very excited to welcome our newest couple Kelly and Ashley. Their wedding at The Madison next year is going to be so much fun! Thank you to their friend Kate for referring us!